There were many, many people involved in this battle, and most of them were brave, courageous men. Every soldier there risked their life for a cause, even if they may have not believed in that cause, and it is unfortunate that every one of these men does not have his own biography, as each of them had lives, their own series of circumstances and events, and they die relatively faceless and nameless. These are the biographies of those fortunate enough to have gained a high-enough rank and earned their time in the sun before they participated in this battle... Here are their stories. 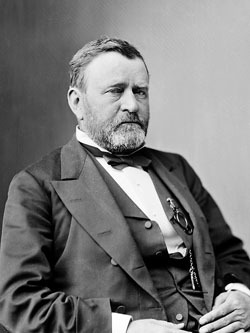 General Ulysses S. Grant was born in Point Pleasant, Ohio, as Hiram Ulysses Grant. In fact, the "S." in his name is the result of a mistake by U.S. Congressman Thomas L. Hamer, who used "Ulysses Simpson Grant" for some reason when he gave Grant a cadetship to the United States Military Academy at West Point. It stuck, due in part to the troubles of bureaucracy. He left it as just "S." for his life, though. Grant married Julia Boggs Dent on August 22, 1848, they had four children together. Unfortunately, being a career military man, his salary was not enough to support a family, especially in constant traveling. When he was posted at Fort Vancouver, as the regional quartermaster for the 4th US Infantry regiment, he had to leave his pregnant wife, along with their first child, at home. He got promoted to Captain soon, but the increase in pay was not enough to have his family with him, and he drank so much (later to be accompanied by far too many cigars) that he was asked to resign, which he did. He followed his early military career with various civilian jobs, including an assistant in his father and brother's leather shop. Later, he got back into his military career, and was given the rank of colonel, and would later become a brigadier general of volunteers. In April, 1862, he was attacked by southern forces commanded by General Johnston, which he was unprepared for, and finally won, thanks to help from General Buell, but with severe losses. General Halleck, his superior, didn't like Grant's performance, and took command of the Army of the Tennessee himself, which led to Grant's decision to resign, which he was talked out of, and he later regained control of the Army of the Tennessee. He continued a career as a general, moving up in power, and became the celebrated historical figure he's known as today. His well-known military career led to him becoming the 18th president of the United States, for two terms. Grant died on July 23, 1885 at Mount McGregor, New York. He and his wife are both buried in New York. Albert Sidney Johnston was born in Washington, Kentucky, on February 2, 1803. He lived most of his life in Texas, which he considered his true home. He went to Transylvania University, and later went to West Point, like Grant, but finished much higher, at eighth in his class. During his later military career, he was considered by many to be the finest General the confederacy had. He married Harietta Preston in 1829, who he left his early military career for, as a lieutenant and chief of staff to General Atkinson, to tend to when she was dying in 1834. They had one son. He began his career again in 1836, as a private in the Texas War of Independence. He advanced there very quickly, becoming Senior Brigadier General of the Texas Army on January 31, 1837. He resigned his position there and returned to Kentucky in February of 1840 and married Eliza Griffin in 1843, and they returned to Texas. He led a very praised and rewarding career when he served in the Army before the Civil War. At the beginning of the Civil War he resigned his then position in California and soon became the second-highest ranked General in the Confederate Army. He would die in battle on the first day of the battle of Shiloh (which just so happens to be the battle that this website is about) while personally leading and rallying his troops in the field. He was hit behind the knee by a bullet, which he didn't think to be serious at first, but the bullet had hit an artery and he lost a lot of blood. His men took him to die in a small ravine. Pierre Gustave Toutant de Beauregard was born on May 28, 1818 to a white Creole family in St. Bernard Parish, Louisiana, right outside of New Orleans. He had many French and Creole-related nicknames while in the army. He, like generals Grant and Johnston, went to the United States Military Academy at West Point, where he became very good at being an artilleryman and military engineer. The engineering training would later serve him very well when he became the chief engineer in charge of draining New Orleans after a narrow defeat in an election to become mayor. As you can tell, he was very at home in New Orleans. He went back to the academy at West Point, where he became Superintendent for a few days before resigning when Louisiana seceded from the Union. He became one of the only eight full generals in the Confederate army. The attack he led on Fort Sumter in April, 1861, is regarded as the very beginning of the Civil War. He was one of two Generals, the other being a General Joseph E. Johnston, who are responsible for winning the First Battle of Bull Run. After narrowly losing the battle of Shiloh because of Buell's reinforcement of Grant, he was appointed commander of Confederate forces in the west; this was for a reason other than promoting him, as the vast majority of the Confederate forces were toward the east. He and General Joseph E. Johnston, with whom he won the First Battle of Bull Run earlier, surrendered to Union General William T. Sherman in North Carolina in April 1865. His life after the war consisted of writing, arguing with Jefferson Davis (they had never gotten along because Davis hadn't allowed him to add Confederate protection to New Orleans near the beginning of the war), becoming the President of the New Orleans and Carrollton Street Railway (he invented the cable powered street cars we know of today, most famous in San Francisco, California), he also ran the Louisiana Lottery. He died in New Orleans on February 20, 1893, and is buried in New Orleans' Metairie Cemetery. He, like Grant, was a supporter of the newly freed black's rights, including the right to vote, which is odd for a once highly-placed Confederate Commander. Don Carlos Buell was born in Lowell, Ohio, on March 23, 1818. Buell's father, a farmer, died in 1823, and Buell was sent to live with his uncle in Lawrenceburg, Indiana. He, like the others on this page, attended West Point, where he was almost expelled several times due to demerits, although, academically, he shined. Buell was known, as an officer in the army, for being very good at enforcing discipline. He was also known for impressive arm and upper-body strength, which he showed off regularly. 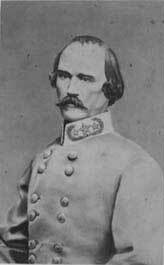 In the army, Buell moved up the ranks quickly, and was appointed Major General of Volunteers on March 22, 1862. He organized the Army of the Ohio, which was the basis of the Army of the Cumberland, which was known for being the highest trained and most successful of the armies. Buell's arrival with more than 30,000 men during the night of the first day of the battle of Shiloh shifted the victory to the Union, as now the combined forces of Grant and Buell greatly outnumbered that of General Beauregard. After this battle Grant held a grudge against Buell for claiming that his arrival was the only thing that prevented Grant from losing the battle miserably. 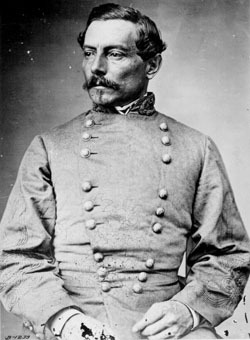 Other Northerners suspected Buell of being a Confederate sympathizer because he was a slave owner (the slaves he inherited), and enforced a policy of not interfering with Southern civilians, and even filed charges against a Union general Ivan Basil Turchin (better known as John Basil Turchin, who was born in Russia), because he was in charge of a pillaging of Athens, Georgia. President Lincoln tried to replace Buell due to pressure from Tennessee politicians, but Buell remained (because of his would-be successor's refusal to replace him). Buell made some decisions that his critics, and there were many of them, saw as huge mistakes, and he was forced to resign from the military in May of 1864. He died in Airdrie, Kentucky, where he was once the president of the Green River Iron Company, on November 19, 1898. Pictures are Public Domain, unless otherwise noted.